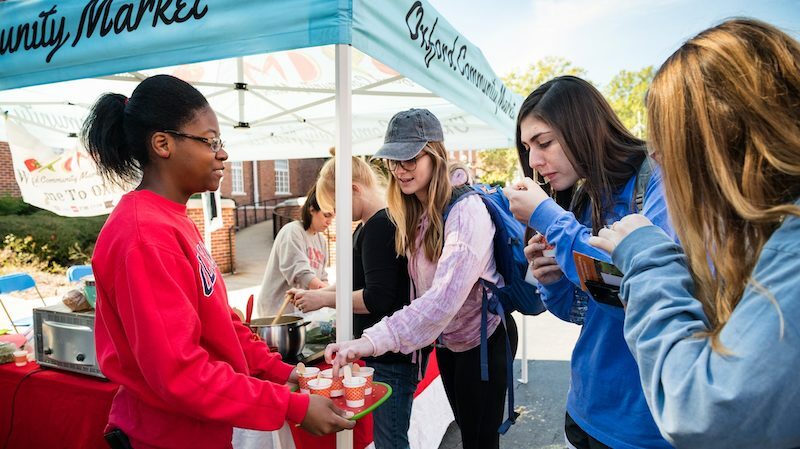 The University of Mississippi and Oxford community’s 11th annual Green Week observance is scheduled for April 20-26. Green Week is a series of events designed to raise awareness of sustainable practices and to highlight organizations and resources available to the community. “Felder is super knowledgeable and delivers useful information in an easy-to-understand and entertaining way,” said Tiffany Bensen, volunteer manager of the Oxford Community Garden Association, which is co-sponsoring the event with the UM Office of Sustainability, Oxford Community Market and Sustainable Oxford. J. 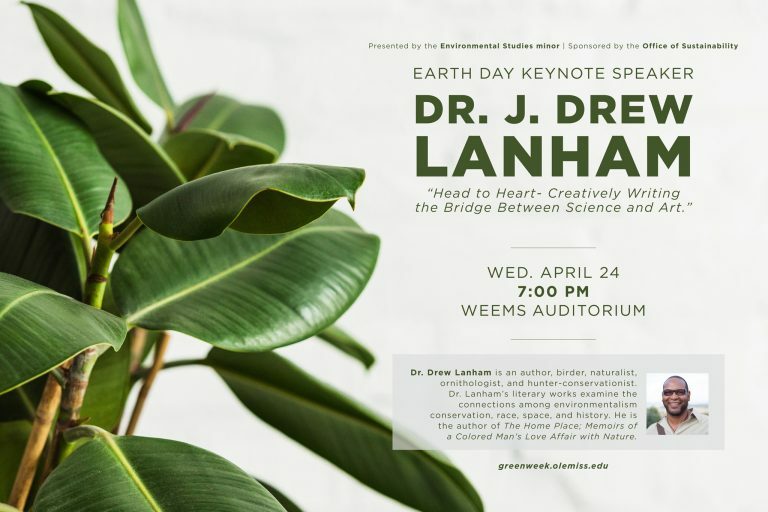 Drew Lanham, songbird ecologist and award-winning author and poet, will deliver the 2019 Earth Day keynote address at 7 p.m. April 24 in the Khayat Law Center’s Weems Auditorium. Lanham is a National Audubon Society board member and author of “The Home Place: Memoirs of a Colored Man’s Love Affair with Nature.” The keynote is presented by the UM environmental studies minor. The annual Sustainability Fair is set for 10 a.m.-1 p.m. April 25 on Galtney Lott Plaza (Business Row). The fair will feature interactive displays from groups representing multiple sustainability topics, including the UM Field Station, Northeast Mississippi Electric Power Association, Oxford Recycling, the Ole Miss Bike Shop and the Oxford Community Market. Sustainability Fair participants will learn about the three dimensions of sustainability, which include environmental, social and economic components, while learning more about local organizations and the role that they play in creating a sustainable community. This year’s event will be low-waste, and will feature a low-waste educational tent and prizes such as bamboo cutlery sets, stainless steel straws and clipboards made from recycled circuit boards. Green Week will wrap up with an opportunity to get outdoors for a “Wonder Walk” designed for the campus and Oxford community, led by naturalist Katie Boyle, creator of Oxford Wonder Walks. Wonder Walks are open-ended outdoor adventures on the South Campus Rail Trail. “Wonder Walks are designed to be more than just a walk in the woods,” McDonald said. “UM students, faculty, staff and community members will have the opportunity to explore nature with qualified environmental educator and naturalist Katie Boyle. Registration is required for this free event, and spots are limited. Campus and community organizations involved in hosting this year’s Green Week festivities include the Office of Sustainability, Office of Campus Recreation, Oxford Community Garden, Lenoir Dining, Sustainable Oxford, Oxford Community Market, University Museum, Strawberry Plains Audubon Center, Oxford Wonder Walks and the university’s environmental studies minor. Green Week is sponsored by Jim Keras Subaru. For more information, visit https://greenweek.olemiss.edu/. SPAC Earth Day Celebration and Swap, all day, Strawberry Plains Audubon Center, Holly Springs – Participants can swap gently used nature-related equipment/gear, books and outdoor apparel. Volunteers will help remove invasive plants and clean litter. Local Dining at Lenoir, 11:30 a.m. and 12:30 p.m. Monday-Friday, Lenoir Hall. Reservations can be made at https://lenoirdining.setmore.com/. Gardening with Felder: “Grow Anything in Anything,” meet-and-greet 4 p.m., Oxford Community Market; lecture 5:30 p.m., Lafayette County and Oxford Public Library. Learn to grow herbs and designer veggies in pots, raised beds and even tree stumps in this free workshop with Felder Rushing.